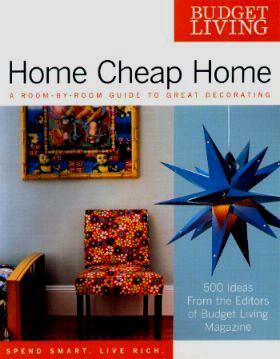 If you hate spending money on items for your home, or if you're strapped for cash but need things for your house, then this book is for you. They've gone about looking for inexpensive ways to decorate, in a professional and inspirational way. "Things" don't have to cost a fortune and there are plenty of examples in here. Whether you love scouring flea markets or garage sales, Goodwill or The Salvation Army, there are many ideas to be had on these pages to help you out of your decorating dilemma. Of course just a fresh coat of paint often works wonders in a dull and boring room. Whether you're into retro chic or ultra modern, you're bound to find ideas that you can personalize. Use old bottles or strange objects you find at flea markets as "new" ornaments. Things like a collection of picture frames, glasses or vases, old books, or an old lamp or two would give your room the necessary "lift" it needs. I wasn't wild about most of the rooms featured but I did quite fancy the kitchen on page 62, the office on page 146, and the closet office (love those ideas!) on page 150. Two ideas I did find myself drawn to is the way-out porch on page 168 and the gorgeous tiles on the floor on page 181. There's also a useful Resources and Index at the back, with toll-free numbers and web addresses where possible. Conclusion - Very interesting and helpful.